The 2017 Riverina Science Festival is shaping up to be another great celebration of National Science Week. With increased support from Inspiring Australia, this year’s extensive program is sure to enthuse, inform, engage and inspire participants from around the region about the value of science, Indigenous science and cultural knowledge and the importance of the STEM agenda. The week kicks off on Monday 14 August at the Tolland Community Centre with a National Indigenous Science Experience Program (NISEP) Community Science Day. This will see Year 9 Indigenous students from Mount Austin High School and Kooringal High School sharing practical science activities with primary school students and the general community. The students will be assisted by science lecturers from Charles Sturt University and NISEP teachers from the respective participating high schools. The event will include activities presented by the NSW Office of Environment and Heritage as well as traditional-tool making activities with Wiradjuri Indigenous Elders. Based on the succesful Redfern NISEP model developed by Macquarie University, the day is a collaboration between nine educational, government, community and non-government organisations. During the Festival there will be a range of one-off events such as Kitchen Science Storytime at the library, which will feature a person-powered bike blender created by the crew of Sustainable Wagga. A Fermentation Workshop is “proving” a hit with the blokes (pun intended) and will be facilitated by the Museum of the Riverina. Wagga Wagga City Library will also host a community access Microscope Morning in partnership with Microscopists from Charles Sturt University. For those with a passion for aeronautics, there will also be an opportunity to explore the science of flight at the Temora Aviation Museum, which is holding a Flying Day on the 19 of August. 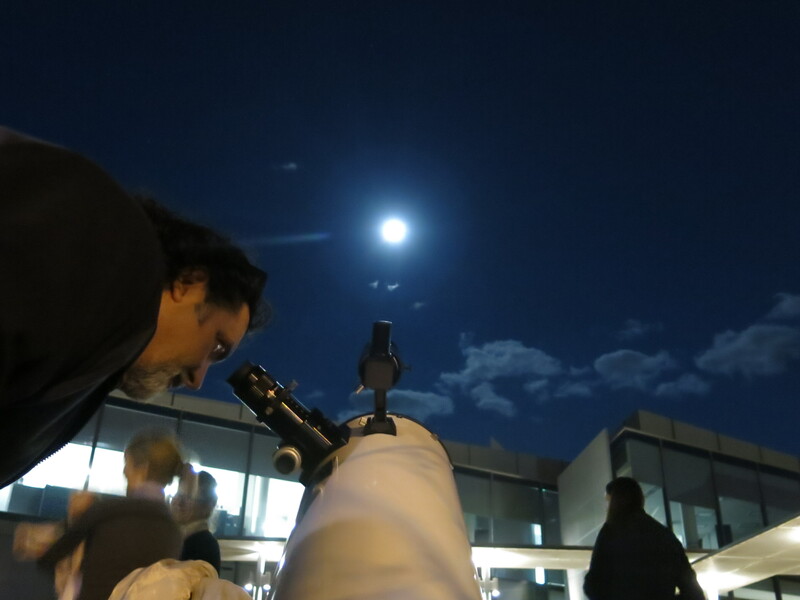 The huge Festival astronomy evening, Sky Stories, promises to be a mini-festival all of its own. This exciting event will feature a state-of-the-art pop-up planetarium, live astronomical observations with the Wagga Wagga Observatory team and the opportunity to share in Fishing Under the Moon, a community engagement project woven around Indigenous hunter-gatherer practices utilizing astronomical indicators such as fish feeding around the moon cycles. Astronomy is the oldest of the sciences and has been employed by First Australians for tens of thousands of years. To celebrate this lineage, a digital artwork will be produced by artist Yenny Huber and animated by Tim Amio. Yenny and Tim have been working with Wiradjuri Elders to highlight two Indigenous sky stories that will be revealed in spectacular visual creations projected on to the side of the Civic Centre. Visit Wollundry lagoon after dusk between Mon 7 August and Sun 27 August to these spectacular projections. Guest post by Christine Bolton, Team Leader Programs, Promotions and Partnerships at Wagga Wagga City Library and convenor of the Riverina Science Hub.